Khan Market houses an old building named Lok Nayak Bhawan, which, if you’ve stayed in Delhi long enough, you may have entered at least once, either to buy some lights for your home, make a trip to Sunflower (the salon headed by some really cute, old ladies), or to grab some booze from the theka. An extensive trip later, we’ve shortlisted shops that you must check out if you’re looking for some interesting light fixtures to spruce up your house. 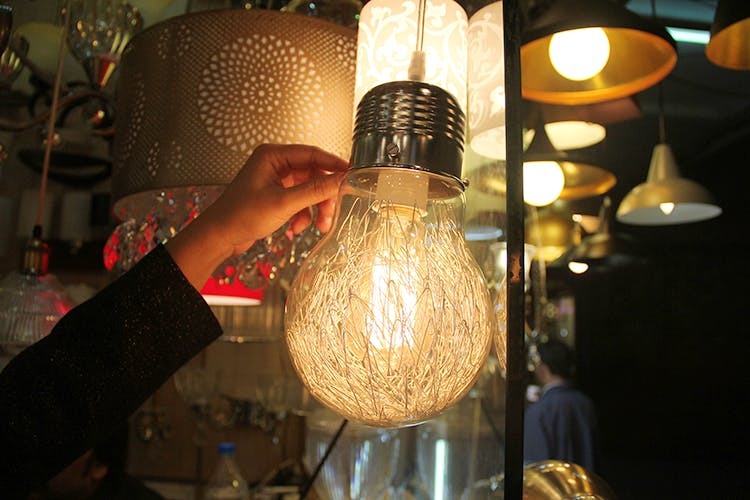 With two small shops to themselves in Lok Nayak Bhawan, Bohemia Lite’s got some very cool lights if you’re looking to give an industrial feel to your home interiors. Our hearts were set on the single bulb pendants and the geometrical light installations, which we feel are priced quite reasonably. If you’ve got the cash, this shop’s got some rather gorgeously crafted lamps in pink, green, and brown marble, which they source from Udaipur, and Makrana in Rajasthan. Scouting for cane ceiling lamps to give your room a quintessential Indian look? You’ll find them in a variety of shapes and sizes here. We even love the ceramic lamp shades they’ve got in single shades, like moss green, turquoise, and beige. PS: If good behaviour is a considerable part of your shopping experience, then you might like to know that the owner of this shop is very friendly and sweet. One of the more expensive shops in the area, you might want to visit Ankur Lighting if you like lots of crystals and bling in your décor. We, on the other hand, were completely blown away by the lights for kids’ rooms that seem to have been inspired from model airplanes—one of these even has a fan that rotates when the light is switched on! You can find lamp shades in all sizes, colours, and patterns here—from mini to large, cotton to raw silk, and plain to patterned. They’ve even got some really cool chandeliers made with recycled Kingfisher and Antiquity bottles! PS: They’ve even got pretty paper mache lamp stands sourced from Kashmir. This is one of those shops that’s got a variety of things stocked, most of which are likeable. We especially recommend them for their collection of brass wall and single pendant lights and lamp stands made of onyx and porcelain. If you’ve got a nice lush garden, you can find antique-looking garden lamps made in aluminium casting. If you’re looking for wall lights in pretty mosaic and mirror work, you’ll find plenty of options here to choose from. They’ll even customise pieces in sizes and designs that you want. Got a modern space to decorate? Decon has copper and brass wall lights with arty patina finishes. Don’t forget to check out the reception wall, which looks no less than an art installation. If you want lighting in your garden, but don’t want to spend too much, this shop’s got options that will serve more of a utility purpose than an aesthetic one. They’ve even got spike lights that you can install near shrubs and bushes. Organising an event and something feels missing? Visit Mr Light and brighten up the party with their indoor, outdoor or decorative recess lighting. This store does not only have outdoor and event lighting but also has a huge collection of modern wall lights to brighten up any room. If you’re in need for some funky lighting this is the store for you. We especially loved their old-school street-style lamps and their spotlight standing lamps.